It may be that a lot of patients are working out their own risks and asking for statins and the GPs do not have the time to screen patients and have nuanced evidence-based individualised conversations in five minutes. Or there is “suboptimal” buy in from the patients or the medics. There is a lot of work to do to improve the packaging presentation and explanation of information to the public and medics in an unbiased way to improve engagement. Fuzzy thinking theory supports a tailored approach to trigger what is known as a “gist” as a cue to remembering what the health message was. These triggers are delivered in public health messages or using on-line decision making tools. There is considerable cynicism in the press and among some in the medical community about the safety of statins and the effectiveness of the risk models. If there were better ways of predicting cardiac risk to help truly identify very likely heart disease candidates then prevention with statins could be more targeted. Genetic tests are emerging, cholesterol tests and blood tests for inflammation are already here. Scans can be used to look at the heart carotid and femoral arteries to see if they are starting to fur up. None of these techniques have been scientifically proven to reduce heart attacks and improve survival, not because they are unlikely to work but the experiments have not been done. Breast cancer is a different disease, screening using x-rays is routine. Genetic testing and the prediction of developing breast cancer is accepted. 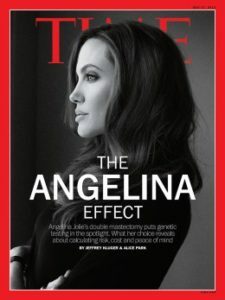 When a high-profile celebrity chooses to have a double mastectomy following genetic testing it makes the news, it doubled the amount of genetic tests undertaken and was called the “Angelina Jolie” effect. This is a good example narrative or a story which people can follow, empathise with and influences attitudes. In women there are actually more deaths from heart disease than breast cancer. If a similarly famous actress were taking a statin would we care? It is hard to think of a similarly compelling narrative out there, hopefully it will come along soon. I like what you are trying to create here Tom however the analogies between screening for Breast cancer in the general population and offering genetic screening for women at risk of carrying BRCA 1& 2 genes are very different situations. The latter group are at a 50-80% risk of developing Breast or ovarian cancer so a prophylactic mastectomy can seem a good risk reduction intervention. Your desire to improve cardiac risk assessment and offer statins to reduce risk may be more on the same level of risk reduction as population screening for breast cancer. Sadly the latter is a political drive now as the evidence for a real true reduction of women dying of breast cancer from population screening is harder to prove. Breast cancer is certainly being diagnosed earlier but back top Prof Bland – we may just be shortening the interval time before the cancer was discovered or screening is picking up better prognostic cancers whose natural history is not to metastasise earlier. I look after patients with Lung cancer and we too would love a celebrity to eulogise about the benefits of stopping smoking instead when celebrities die of Lung Cancer their families tend to name the secondary site such as ..they died of liver cancer ..such is still the stigma of dying of a smoking related disease. My sense is if we can make assessing risk easier for GPs then your wish may stand a chance. I am enjoying you blogs. Thankyou for raising awareness and putting the information out there for us in basic language! Keep them coming ! Tom, very interesting……a great contribution to the community and I hope your blog is read by those In a position to influence treatment and advice.